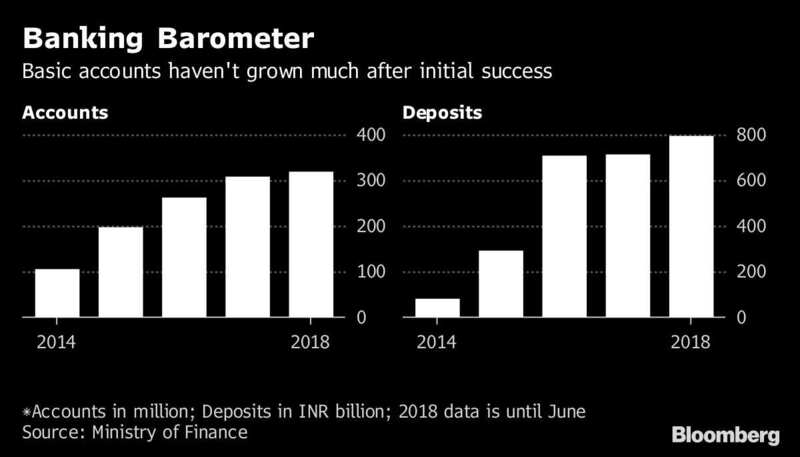 New Delhi: A shortage of bank branches and ATMs across India’s hinterland is holding back Prime Minister Narendra Modi’s financial inclusion efforts and risks angering rural voters ahead of elections next year. After taking office in 2014, Modi set an ambitious target to open a bank account for every household to ensure welfare funds flow directly to India’s poor, while improving access to credit and insurance programs. He pushed policies that helped bring 310 million people into the formal banking system in just four years, according to the World Bank. 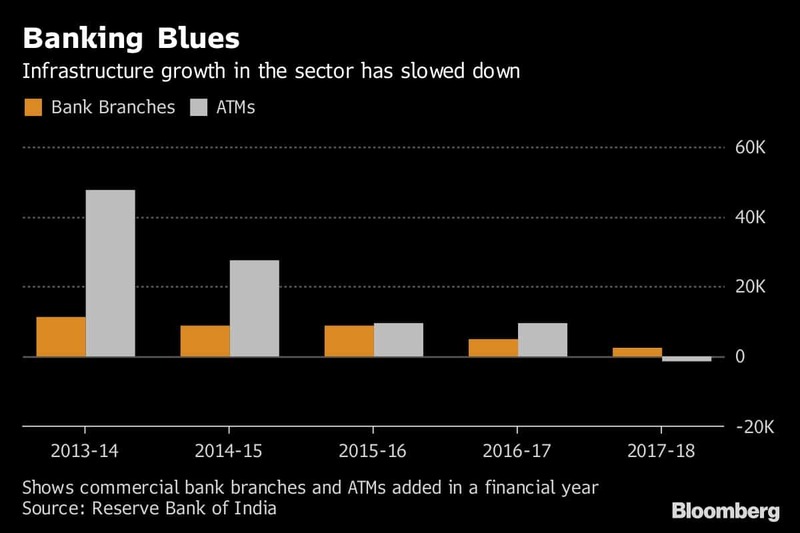 But many of India’s villages still lack bank branches or ATMs to help service these new customers, while the pace of building new financial infrastructure has actually slowed. Because Modi’s government effectively forced poor citizens into the banking system by linking some welfare benefits to bank accounts, villagers have ended up stuck in long queues and struggling with ATMs that often run out of cash or break down. With an election due next year, the mismatch between the government’s policies and the rural banking system is generating frustration among a key slice of India’s electorate. “In rural areas, we have found a serious and debilitating shortage of banking infrastructure," said associate professor Reetika Khera of the Indian Institute of Management in Ahmedabad, Gujarat, who has conducted research in India’s villages. “A very large number of poor labourers and social security pensioners are affected by these issues on the ground, so it won’t be surprising if people are angry." A spokesman for the Prime Minister’s Office did not return a call seeking comment. Finance ministry spokesman D.S. Malik said the government has taken steps to ensure Modi’s financial inclusion policies are enacted, including empowering individuals such as teachers and shopkeepers to provide some banking services as well as improving rural banking infrastructure. India’s banking system “lags in terms of physical infrastructure and has failed to reach the poor," said a 2017 study from EY and the Associated Chambers of Commerce and Industry of India, which found 19% of the population still lacks access to the formal credit system. The experience of villagers in Jogaliya in Rajasthan, India’s largest state by area, is typical. The village of about 5,500 people has no bank branch or ATM, and the closest one is 15 kilometers away. That’s a 60 rupee (87 cents) bus ride that would have been unnecessary before the government made it mandatory to have bank accounts to get old-age pensions and other welfare payments. “They don’t increase facilities, but they take away my money," said Rajuram Jat, 32, of Jogaliya, who complained in late May about endless text messages and charges from his bank. He said he wouldn’t vote for Modi in 2019. Many Indians were forced to get bank accounts when Modi demonetized 86% of India’s cash overnight in November 2016. The banking system struggled to keep up, while some gains proved temporary. Nearly half of Indian bank accounts were inactive in 2017, meaning they weren’t used at all in the previous 12 months—the highest share in the world—according to a World Bank report. A pilot program that looked at the direct transfer of funds to villagers’ bank accounts in the eastern state of Jharkhand showed some people had to spend as much as 96 hours withdrawing money and purchasing rice from government ration shops. With financial and digital literacy already low, cash shortages and “issues with direct benefit transfers further dent public faith in electronic payments and reinforce the demand for physical currency," said Saksham Khosla, a research analyst at Carnegie India. “Banking infrastructure will always look inadequate to us because of our huge population and the difficulties in accessing cash," said Sumita Kale, an economist at Indicus Centre for Financial Inclusion. “Still, as so many people come into the banking system for the first time, there has to be a better monitoring and supervision framework."